Qello is a unique app that will give access to tons of concert footage from your favorite band. 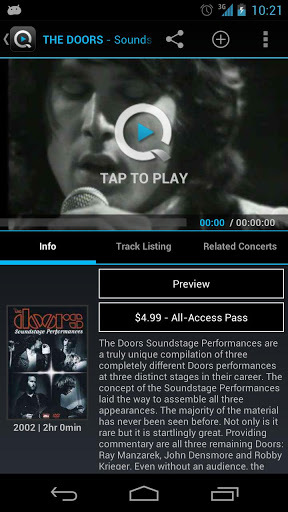 This app is perfect for those who prefer watching a real concert as opposed to listening to studio recordings. Qello’s main functionality is to make it easy to gain access to all sorts of live content from all of your favorite artists, new or old. Qello is an app that aims to provide a better experience to true music fans. This app is designed to get you in touch with real concerts with high definition video and audio. The quality of the content is actually amazing and it will get you as close to the actual performance as possible. This app is designed so you can easily relive live performances from your favorite artists through video instead of just audio. If you choose to buy the subscription, it will unlock all of the content on Qello. While the subscription is a little pricey, it will indeed give you access to a ton of content. The only downside is that without the subscription, you only get access to previews and Qello’s TV service. Still not bad considering that app doesn’t cost anything up front. Qello TV is a service that has multiple channels and will allow you to sit back and enjoy content as it appears. While the content does not cost anything, you won’t have to ability to pick specific content, you simply have to watch whatever channel you pick and what it gives you. Qello also gives you access to plenty of documentaries. It features an award winning series called Classic Albums that specifically looks at the creativity required to produce certain albums. Overall, Qello is a truly fantastic service. It may be somewhat avoidable due to the cost of the subscription, however, if you do take the plunge and purchase it, you will not be disappointed by the amount of content. Additionally, there is plenty of content you can watch without pay any money at all. This makes it easy to try out the service before you decide to sink some funds into it.